Regular readers will know I have been doing a challenge called Reading Down the House for the past year. I owned 17 books that had been sitting on my bookshelf for ages unread. I am determined to finish them all by the end of 2014! I haven’t posted about it for a while because I’ve been resisting my own plan, and I keep thinking “I have loads of time left!” I realized I stopped looking forward to the challenge because I have at least two books a month that are “required reading,” one for Reading Down the House and one for my book club. Even though I always fit in some “off-list” books, I can’t read them in the more leisurely way I would like. Let me tell you about my book club. A friend approached me seeking advice on starting one up. We planned it together and I am a member. The theme is International Fiction; that is, books which are set in other, mostly non-Western countries (although we did do one Canadian). Five to eight of us meet each month in one of our homes to discuss the latest book. We all put forward titles of books to read in the future. So far we haven’t declined any books that have been proposed, unless the library has too few copies. Despite our best efforts to choose diversely by country and theme, the books have been a grim lot. It is an eye-opener to read about actual living conditions around the world. But reading and discussing these topics monthly has added a little layer of stress to my life! This is countered by getting to meet and chat with the group for social time, and being in the company of lovely smart people who are prepared to talk about serious books! Plus, there is the educational aspect of learning about other places and cultures, and finding new authors to read. I am not the only one who is feeling overwhelmed by the necessity of reading such weighty content, so over the next few meetings, I hope we’ll devise a scheme to break the pattern. I once belonged to a book club where most of the group read the assigned book, but at the meetings, no one bothered to discuss it except to say if they liked it or not. I don’t want to go that far. But maybe we can vary the topics more and choose some lighter fare, or change themes. Otherwise, book club feels like a chore and we don’t want that. I could also pull rank as a librarian and strongly recommend titles I approve of, but I don’t want to squash anyone else’s choices. Now that I think of it, perhaps I could email out non-spoiler book reviews of proposed titles so that we can all make more informed decisions on what to read. I mentioned last time that I gave up on one of my own books, Citizen Girl, bringing my Reading Down the House list to 16. Since it was in the chick-lit category, I will happily substitute another of my choice, from the library. I am thinking of picking up Me Before You by Jojo Moyes because it was such a blockbuster. Happily, I did read one of my RDTH books this month, and it was excellent: The Birth House by Ami McKay. The author was the instructor at a writing camp that Link attended a few years ago. Link came home with a signed copy of the book, loved it, and begged me to read it. But did I? Nooo. It starts with a scene that threatened sexual abuse, and I was in the middle of reading Pope Joan, which also contained a lot of abuse of a young woman. I just couldn’t stomach another similar book, and then I kept avoiding it. So I really had to force myself to read it, but as it turns out, the threatened event doesn’t happen (not a spoiler) and the book takes many more positive directions. I liked that it was set in historic Nova Scotia and I know the places cited in the book. Of course I could kick myself for putting it off so long and for not taking the opportunity to discuss it with Link. I will have to find out if they remember it! I have two left on my Reading Down the House list. First is One Hundred Years of Solitude. I tried not to leave all the serious ones to the end, but they have to feature in the mix! The other is a music book, From the Velvets to the Voidoids. I purposely left it for last because I am looking forward to it and I know I’ll be able to plow through it no matter what! As recorded on my Goodreads page, of the 14 RDTH books I’ve read to date, I loved 6 of them, liked 6 of them, and didn’t like 2 of them. I think my success rate at choosing my own books is a little better than the ones chosen for me by the book club, but not perfect! As a result of all this “required reading,” I have less time to read what I choose, or what catches my eye. I would have liked to read more graphic novels this year, and I’ve only read two Young Adult (teen) novels. Quite often I put a hold on a new book at the library, and I either have to suspend it (defer until later) or pass on it because of my other reading obligations. What I’ve been doing a lot is cramming – reading what I like, and then pulling a couple of late nights to get the book club title done at the last minute! In 2015 I look forward to reading what I like all the time. I’ve already started a list of books I’m dying to read – I just don’t want the list to become an obligation, either. I look forward to having a clean slate! If you have read any books from your own house lately, feel free to link your book reviews or posts in the comments. I am always happy when someone presses a book on me and says “You must read this.” The last book I got that way was “The Hare with the Amber Eyes” which I liked a lot (well written, family memoir, Holocaust literature, a little about Japan post WWII). My stack is down to 5 books, and I’ve got 2 boxes ready to go to Housing Works (they run a great used book cafe in SoHo) to make room for some more. I have read The Hare with the Amber Eyes and I liked it too. I read two books this year that friends pressed on me: Beatrice and Virgil, and Snow Flower and the Secret Fan. Both well worth reading but challenging. I have just given away two bags of books as well! I was an avid reader in the past. A child with a flashlight under the covers. Parents doing bed checks to make sure I was truly lights out. Reading was my favorite chill-out bed time habit. I always had at least 2 books going. I liked to read all the books of one author – so I always had one of those in the works. And – I liked reading whatever was on the New York Times Best Sellers List. Then – in my 40s my eyesight required reading glasses – then all day bifocals. I couldn’t read laying in bed. Just couldn’t focus. I fell out of my reading habit. It makes me sad. I’ve tried picking it up again. But – it hasn’t worked so far. I still read books. Just not like I once did. I miss my night time reading habit. I would get to bed earlier – to allow myself time to read. Snuggle down with a book. Read until I was sleepy. If a book really grabbed me and I couldn’t put it down – I may retreat to the living room sofa until forcing myself to stop “at the end of this chapter”. My sleep habits were so much better back then. Sigh… I’m going to work on making that a habit once again. I don’t seem to have any problem reading with my bifocals! I can’t read in bed, though. I always fall asleep after about 3 pages. So when I really want to plow through a book, I stay up and read in the living room or at the kitchen table! I’ve finished all of the unread physical books that I intended to read this year..admittedly I did achieve this in part because I decided not to finish some of them! Several of my books were non-fiction books related to former interests, and I was no longer interested enough to plough through them. Next year I am planning to read through the books on my Kindle (I have a bad habit of downloading things and not actually reading them…) and reading my knitting books properly. (So far I have dipped in to most of them but not read them properly). Hi Nicola, Yes, I have seen your progress on Goodreads and you’ve read a lot! Fortunately I don’t have an e-book habit yet. I use the library service, so the e-books expire and go away! It would be very, very difficult not to pull rank when you’re a librarian! I’m intrigued that the Book Club books were so affecting. As hard as they were, it sounds like they have really altered people’s views. Again, with RDTH Challenge, sounds like ‘work’ in some cases but work to be glad of. Hi Fiona, I really do think the book club is worthwhile and the books are so worth discussing. It just gets depressing at times! On the other hand, if we read lighter books, there might not be much to discuss! I know you are reading a lot. Hope you find something good to read over the holidays! 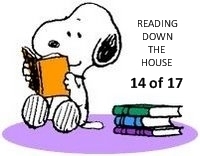 That Snoopy can read. I have so many partially read books. Thanks for the impetus. Sadly, I have developed a new batch of unread books for next year! But at least they will still all be current, unlike the last batch, which were sitting around for years. The book club I belong to is discussing ‘Americanah’ tomorrow evening. Should be an interesting discussion as we are a diverse group of women. I admire your book club’s ambitions, but I don’t think I could do it – I am too affected by books and would likely feel too overwhelmed with the content each month. I hope you can find a balance without losing the educational aspect and discussion you seek. We are still trying to find our system. This year, because of the demands of one member, we decided to have target genres. We each came to a meeting armed with suggestions for each genre and then voted on which one we would read. It took FOREVER to go through the 7 genres and pick, and there were arguments along the way (as mentioned, we are diverse)! Next year, I think each person will just get a pick and we will all have to read the book whether we like it or not! No discussion. I am not totally satisfied with this approach either, but we are not sure how else to do it! The one thing we have done well is having a mix of serious with lighter fare. We did read ‘Me Before You’ and I believe all of us really enjoyed it. I am enjoying the book club experience (my first one), but I do have difficulties reading something required of me rather than my choice. It has lead to some good reads, and some horrible ones (‘The Shack’ comes to mind). I laughed aloud at the last line of your comment. A certain someone recommended The Shack to me and I read it out of respect to them. Enough said! I am interested to know if your group likes Americanah. At our meeting tomorrow night, our group is doing A Tale for the Time Being. 100 Years Of Solitude is one of my favourites! I don’t think I could commit to a bookclub, too much pressure to read particular books within particular timeframes! I think I will like 100 Years so I am not dreading it or anything! I do find the time lines tough (even a whole month) because of my other reading. I’m done reading down the house! You inspired me to do it a few months back. I just picked a book up from our neighborhood bookshelf though to read called “Motherhood the second oldest profession” that I’m going to start next. I just finished reading Inside the Box yesterday and I really liked it. I wrote a short review on goodreads. Congrats on finishing your books! I am impressed. You are always reading something good. Inside the Box sounds like a worthwhile read. I remember some of those Erma Bombeck books. I wonder if they are dated now. Some of these look good. Thanks for the recommendations! Oh my goodness! I have an entire, double-wide bookshelf dedicated to books I haven’t read. Once read, they are either moved to the “keep” shelf in our living room or out to donation. I set a goal each year to clear them and each year, I fail. I suppose I will have to allow myself to quit those that don’t envelope me in the first few chapters. May I follow you on Goodreads? You bet! I will look for your request on Goodreads. I did a Reading Down the House a few years ago (pre-blog) and read 8 books. This time, I ignored a few titles I doubt I’ll ever read. I have mostly stopped bringing home discarded books from the public library where I work, because that got overwhelming, but now I have 4 awaiting reading! And I shamefully bought two books this month I couldn’t resist. This could go on and on! Things went well at our meeting this week. I am feeling encouraged! I think it is a great idea that you post reviews of a small selection of novels before your book club meets. It’s what the librarians in our book club do. So helpful as they/you get to see new releases and come across books every day as well as all the publisher material. For a while we met in s bookshop. Having the owner there was great in thst he could give us details about new releases, which book was doing well, which author was appearing at the writers’ festivals etc etc. Made picking books easier. As to my Reading Down the House, I’ve paused with two books to go. Think one (Wolf Hall) will just have to go to the never will be read list. I haven’t been too tempted by the Hilary Mantel books; they seem like such a slog. I am on my last book.